We service all of your home power washing needs. From siding, to decks and patios, to walkways and driveways, we handle your property with care and do it right the first time! We manage all types of commercial power washing services; including, storefronts, sidewalks, and fleet vehicles. No water onsite? No problem! We are self-contained and will bring water to your location. 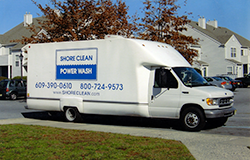 We have served the power washing needs for hundreds of customers in Cape May and Atlantic Counties over the past 25 years. Our experienced crews know how clean and care for your property with no nonsense. You won't find banding or shadows on your deck or siding like you may find from the "guy with a pressure washer." We use all professional-grade equipment and we have the experience to use it correctly.